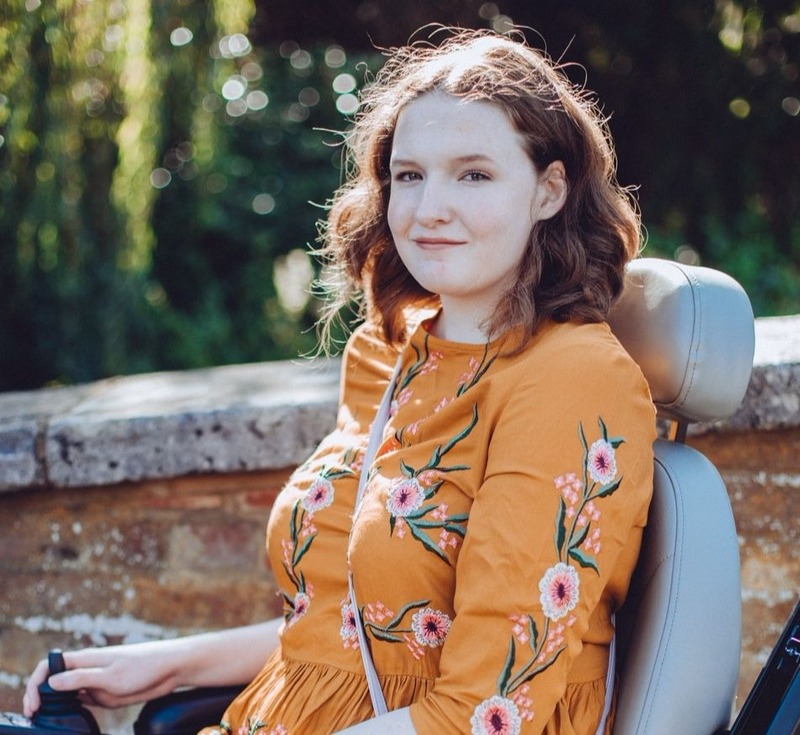 On Instagram I follow a few powerchair users who together have really helped to inspire and motivate me to embrace fashion more and to explore my style. 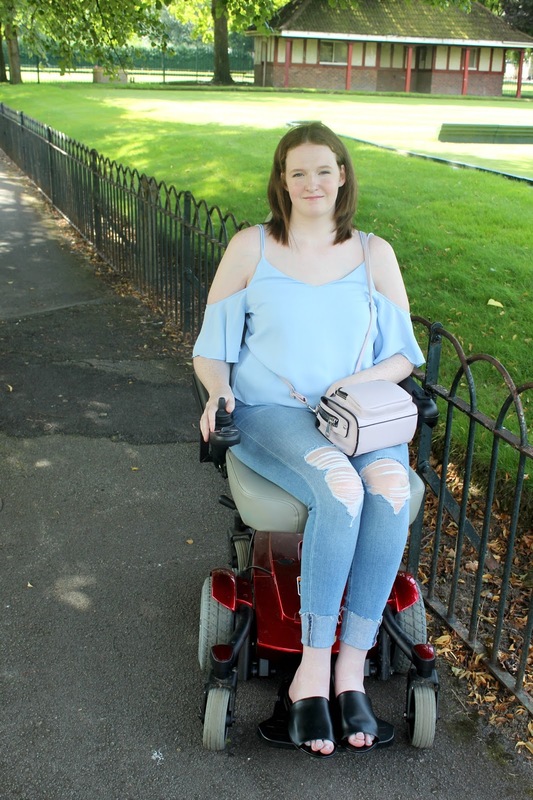 As I've said recently, I've found it difficult at times adjusting to dressing as a powerchair user but I think I'm finally starting to nail it and one of the people who has inspired me to take more outfit photos is Sally from Wheeling Along. 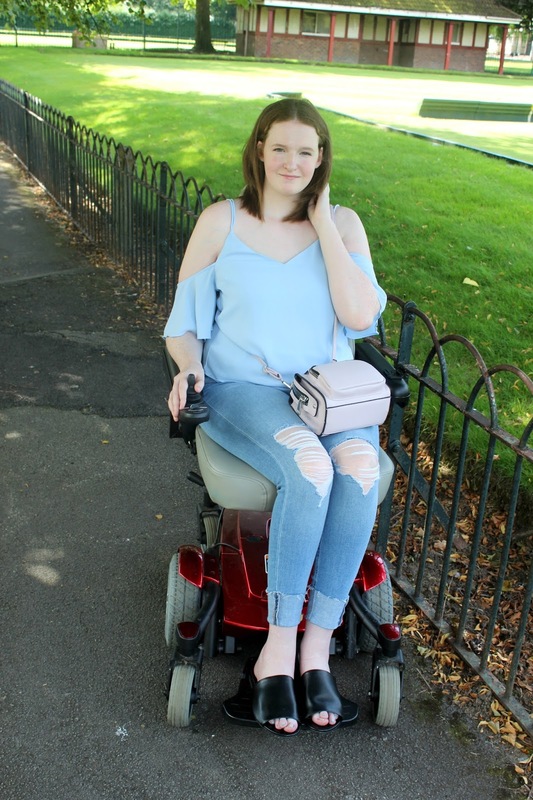 We got chatting a few months back and came up with the idea of doing a little blog collaboration as our styles are so different. She rocks the most stunning dresses and I'm more of a jeans and t-shirt kind of girl so we thought it would be fun to pick a theme and see what outfits we'd both put together! So, for a little while we've been adding some images to a Pinterest board to give us inspiration and it ended up being full of gorgeous pastel colours. 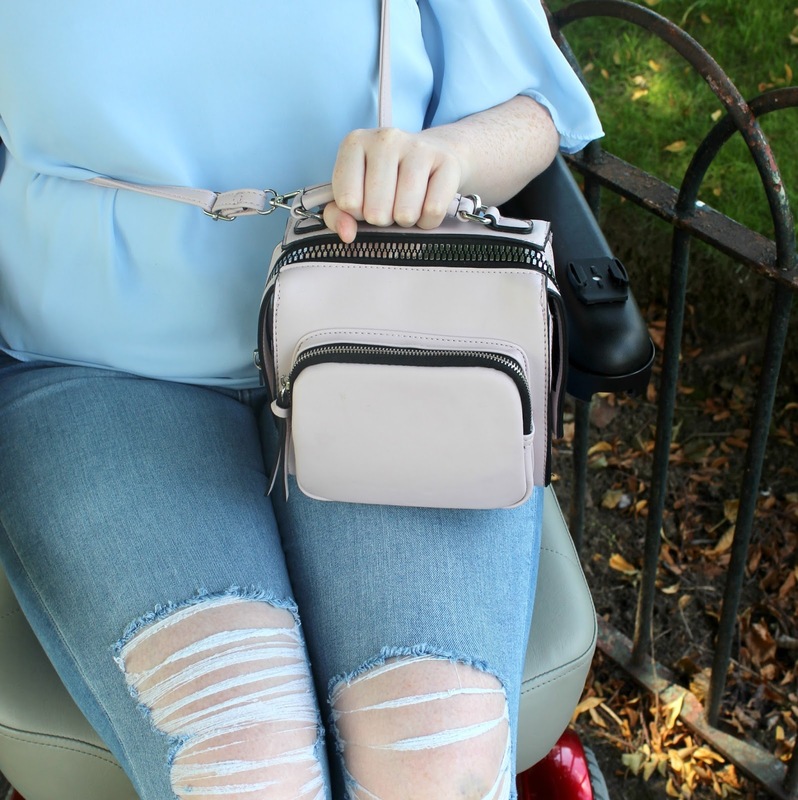 So, here is my take on a pastel inspired outfit, make sure to head over to Sally's blog to check out her outfit too! If you hadn't guessed by now then I'm a bit of a New Look fan! 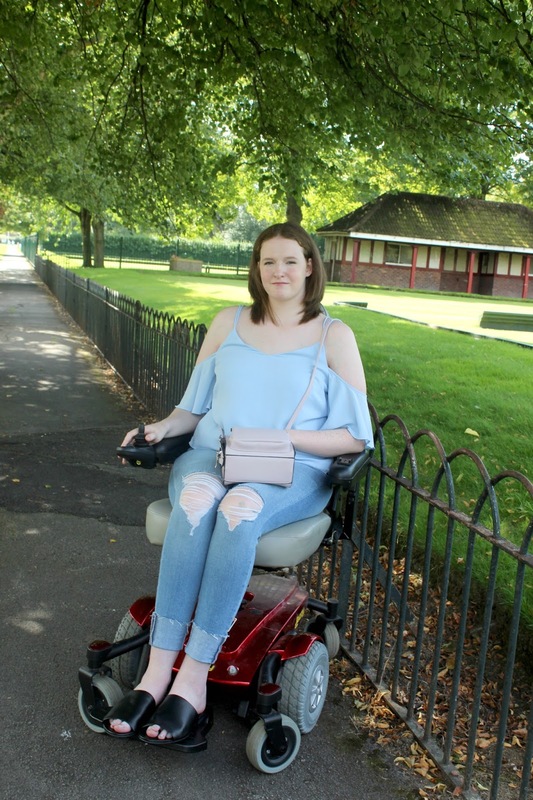 I really love both their standard range and their tall range, especially for jeans, so this outfit is a pretty realistic snapshot of my wardrobe because I really do wear mostly New Look clothes these days. I bought this stunning cold shoulder top in Spring and if I remember rightly it was under £15 (it's now in the sale for £7! ), it's been one of my go-to tops for evenings out since then. The material is quite thin and it's been perfect for both Spring and Summer, it's one of those items that you can dress up or down. You'll probably recognise these jeans as I've already featured them on my blog quite a few times over the past month, I really have been living in them as they are so comfortable and I love the turned up hem. Carrying on with the pastel theme, I picked up this bag in the New Look sale about a month ago, I was getting bored of my bag (which I'd had for about 4 years) and thought it was time to try something new. It's a gorgeous lilac colour but it's also a lot bigger than it looks, the perfect size for everyday use. Sadly the bag is no longer on the website but I've linked some other gorgeous lilac bags above! The shoes are Primark, just something simple and comfortable, and a bargain too as I picked them up in the sale recently for only £3. 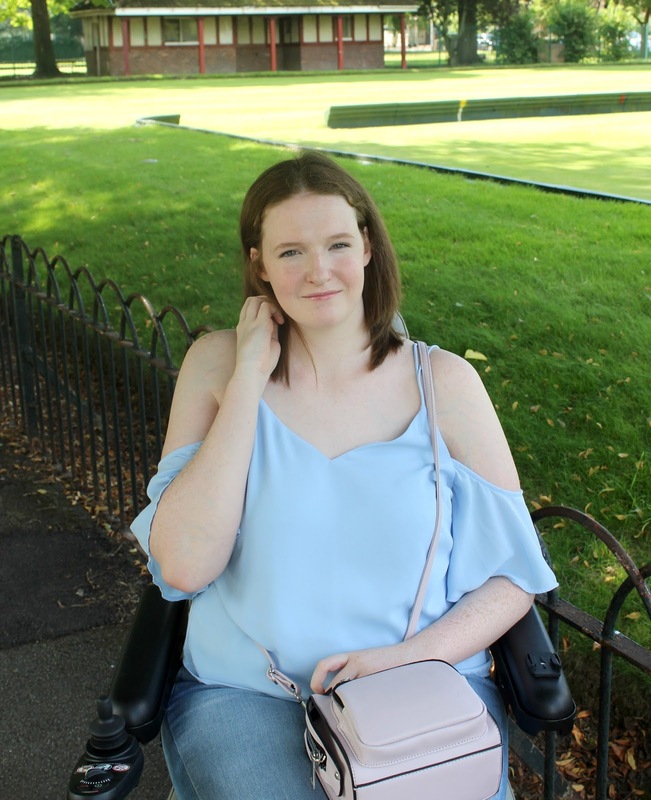 I'm definitely getting as much use out of my pastel clothes as I can whilst Summer is still here! Make sure to check out Sally's Twitter, Instagram and Blog!